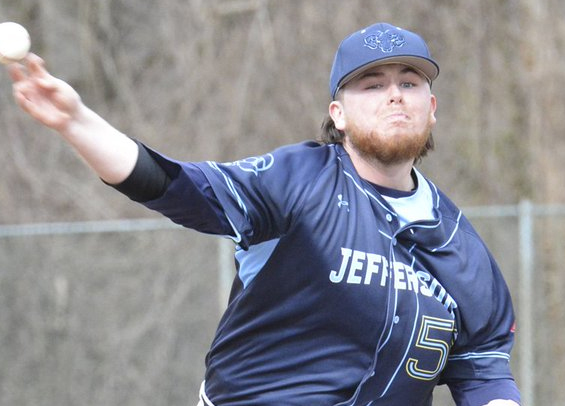 Patrick Hohlfeld had a career day on Wednesday, tossing eight innings while collecting a career-high 15 strikeouts in an 8-2 Jefferson win over Goldey-Beacom in the first game of a doubleheader. The sophomore right-hander allowed five baserunners through the first seven innings with four hits before surrendering a pair of runs in the eighth via a triple and single. The Rams dropped the second game of the twin bill, 18-10. Goldey-Beacom put up a pair of seven-run innings to put the contest out of reach. Timothy Brodhag continues to swing a hot bat, finishing 4-for-8 on the day with three RBIs. He's hitting .424 on the season with 18 RBIs. The Rams are back in action on Friday when they travel to Hockessin, Del. for another doubleheader with the Lightning. Chestnut Hill 3, Felician 1: John Contoudis finished 1-for-5 with a pair of RBIs, and Billy Bethel tossed eight strong innings surrendering one run on eight hits to secure the win. He struck out seven. Will Shaffer picked up the save. Felician 5, Chestnut Hill 2: Jared Healey picked up two of the Griffins five hits in the contest. Thomas Hughes took the loss, surrendering four runs on seven hits over four innings. USciences 7, Wilmington 5: Joe Duffy finished 4-for-4 with a pair of RBIs for the Devils. Ryan Johnson collected two hits, drove in a pair, and secured the win on the mound by tossing two scoreless innings in relief.